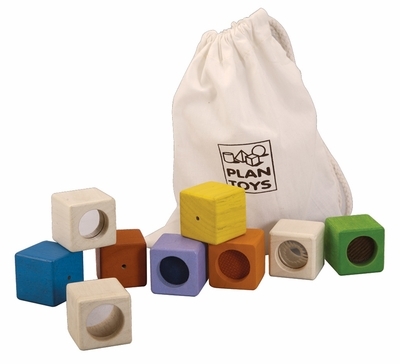 Plan Toys 5531 - Set of 9 blocks. Blocks are stackable and have different textures, sounds and colors to stimulate touch and feel. Set contains 3 visual blocks, 3 auditory block and 3 feeling blocks. Store them in the cotton bag. Made for rubber wood. Printed with non-toxic water colors. Block measures 1.4" square. Recommended for 1 years and up.